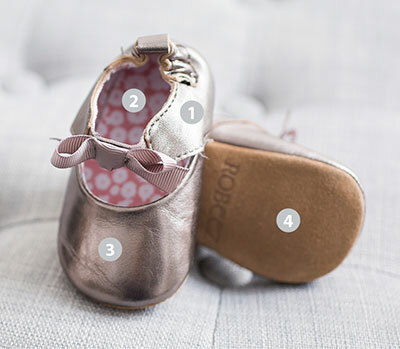 Your daughter will be very chic wearing this black leather baby shoe designed to look like mom's espadrille. Part of our new First Kicks collection, this shoe has a shoe-like fit and a cushioned insole like our Mini Shoez, but a soft sole suede bottom like our Soft Soles. These shoes are super cute & appear to be well made. I like that they are not wide like a lot of other baby shoes because my baby's feet aren't wide. 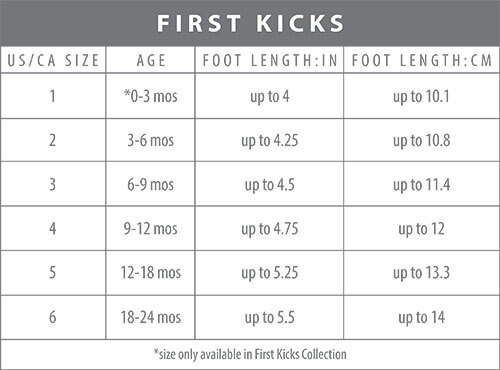 I would recommend measuring your baby's feet opposed to going by the age. I did not go by the age, since that never works for my baby. She's 13 mos old, but has tiny feet. I in fact went by the sz of some of her other shoes and the sizing chart, instead of measuring. The sizing chart indicated that she needed 0 to 3 mos. They fit exactly, so we probably could have ordered 3 to 6 mos. However, it may be best that it really fits so that they won't fall off her feet. You'll decide what will work best for your little one of course.